For the beer battered lemon sole, sprinkle the yeast, salt and sugar into a mixing bowl, whisk in the beer and vinegar, then the flour and herbs. Set aside to ferment for one hour or until the mixture begins to bubble. Meanwhile for the rapeseed tartare sauce, whisk the egg yolks and vinegar together in a bowl. Continue to whisk the mixture and slowly pour in the ‘Wharfe Valley rapeseed oil’ until all of the oil is incorporated and the mixture is thick and light. Stir in the capers, gherkins, shallot and herbs. Season to taste with salt and pepper and a squeeze of lemon juice—set aside in fridge. Heat ‘Wharfe Valley rapeseed oil’ in a deep based frying pan until a bread crumb sizzles and turns brown when dropped into it. 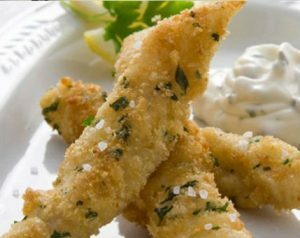 Dip the lemon sole goujons into the batter and fry for 3– 4 minutes or until golden brown. Leave to drain on kitchen paper. Serve with a bowl of the ‘Wharfe Valley rapeseed’ tartare sauce.